Free Printable DIY Rustic Christmas Ornaments! | Happy Deal - Happy Day! 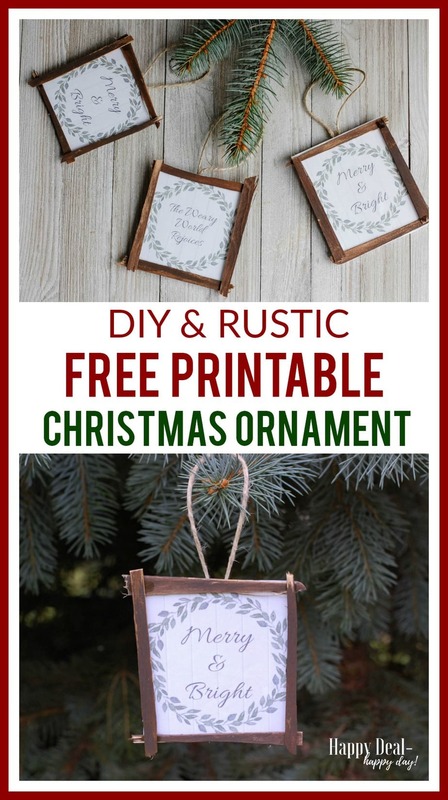 Free Printable DIY Rustic Christmas Ornaments! 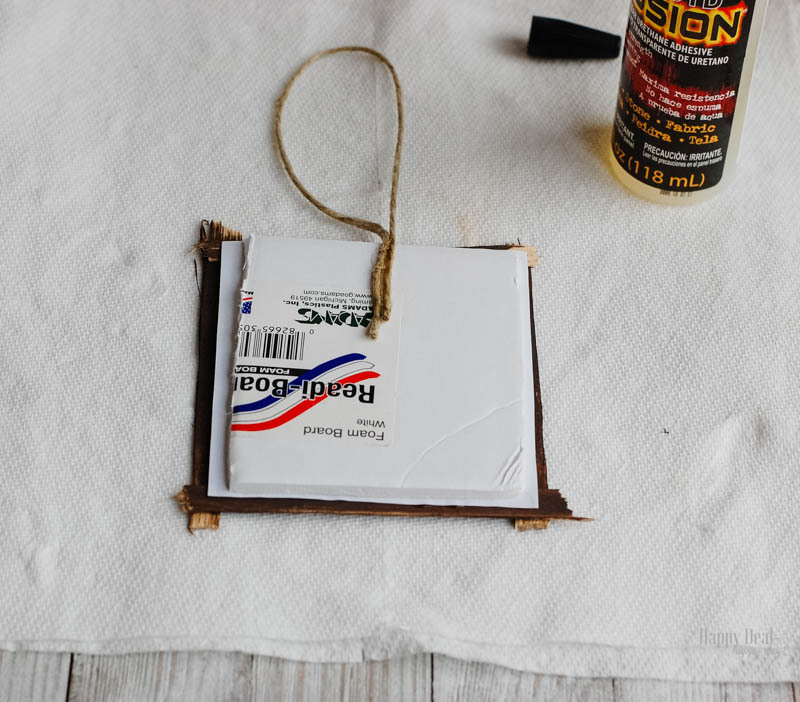 I have a very easy DIY rustic Christmas ornament craft idea to show you. All you need is to print out the image I have created, and turn it into a rustic Christmas ornament that you make yourself! It’s so easy that you can have the kids make these and even use them as gifts for their teachers or grandparents! 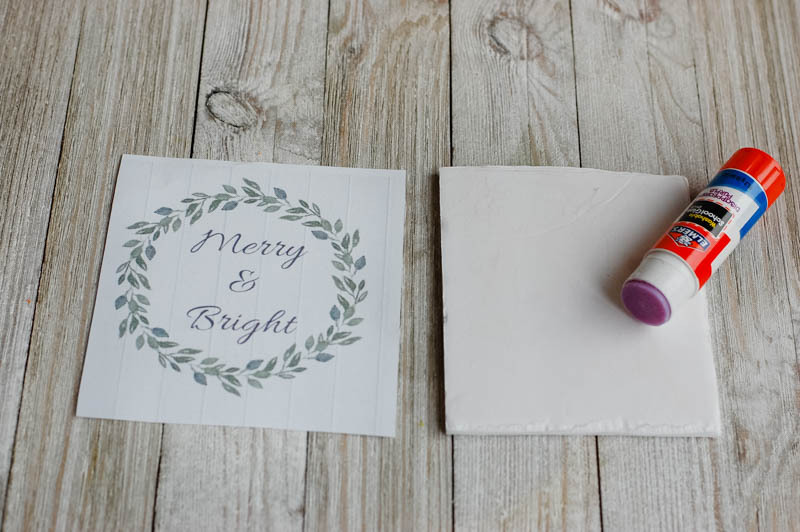 Sign up below to get your free printable which comes with two “Merry & Bright” and two “The Weary World Rejoices” so you can make a total of 4 ornaments. So why did I choose these quotes for my rustic DIY Christmas ornaments? Well, “Merry & Bright” is something I think all of us want to be this time of year. We should be merry & bright all year long and not just at Christmas time, but this a good reminder to hang on our tree this season. My ultimate favorite Christmas Carol is O Holy Night! I can’t sing it worth beans, but I do love the lyrics – especially when we sing about the weary world rejoicing! I know we all feel weary in our nation – but we can take a deep breath, appreciate this time of year, and realize that our Savoir has already been born – so let’s rejoice! Sign up below and you’ll get this free printable sent right into your inbox! Get Your Free Printable Christmas Ornaments! 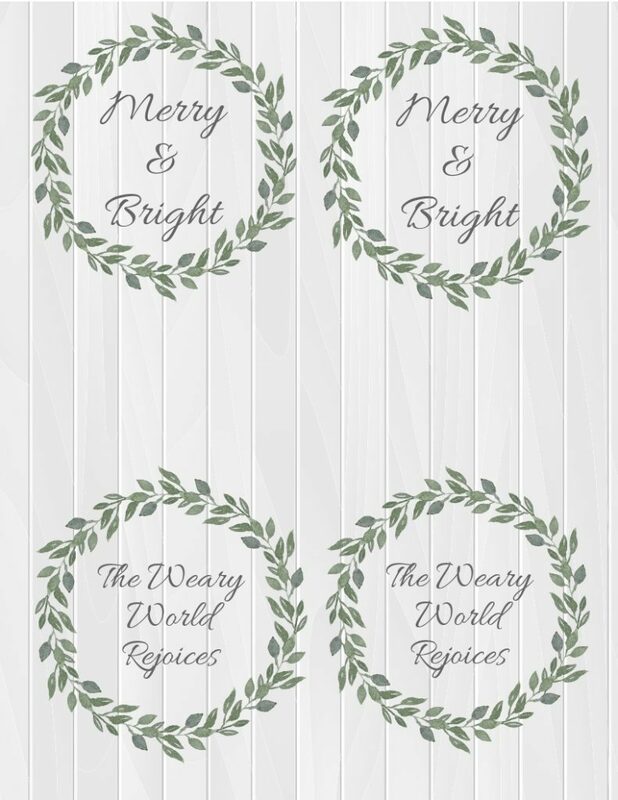 Now the first thing you need to do is print out your “Merry & Bright” and “The Weary World Rejoices” Christmas wreath images. Then cut those into squares and use a glue stick to attach it to a piece of foam board. We are just using the foam board to give it some extra structure. 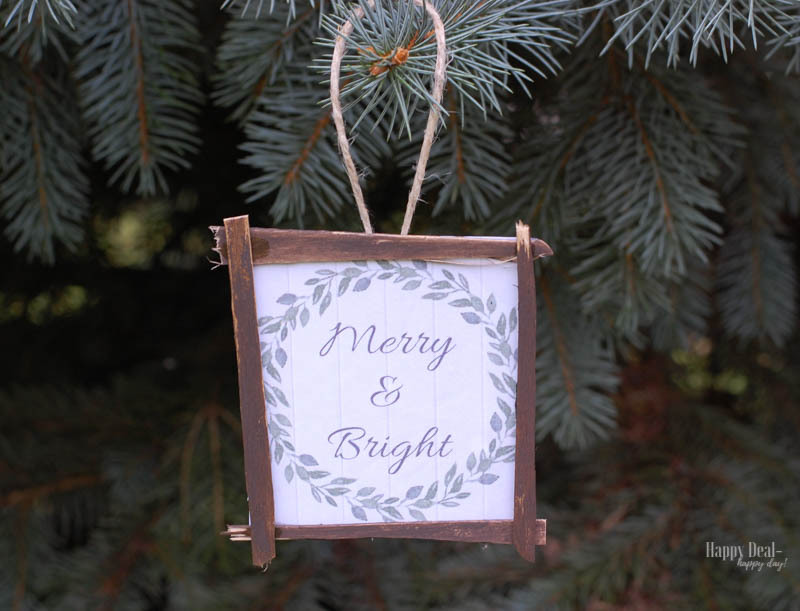 Since this ornament has a “rustic” feel to it, you will frame it with simple popsicle sticks that have been broken in half. You want them to look broken and a somewhat jagged. You can even break off the ends so the curved part of the popsicle stick isn’t part of the ornament border. 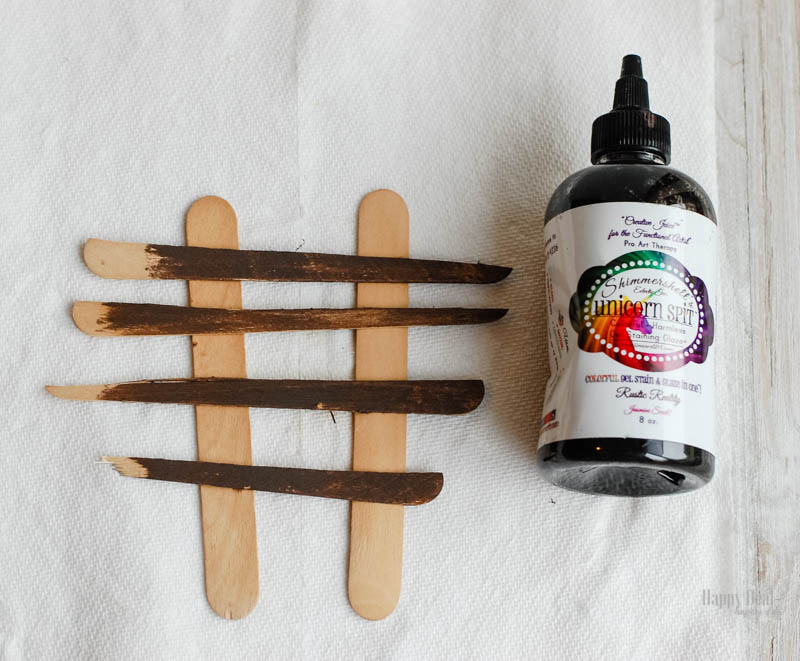 Then you need to put on a small amount of Rustic Reality Unicorn Spit to stain the popsicle sticks. 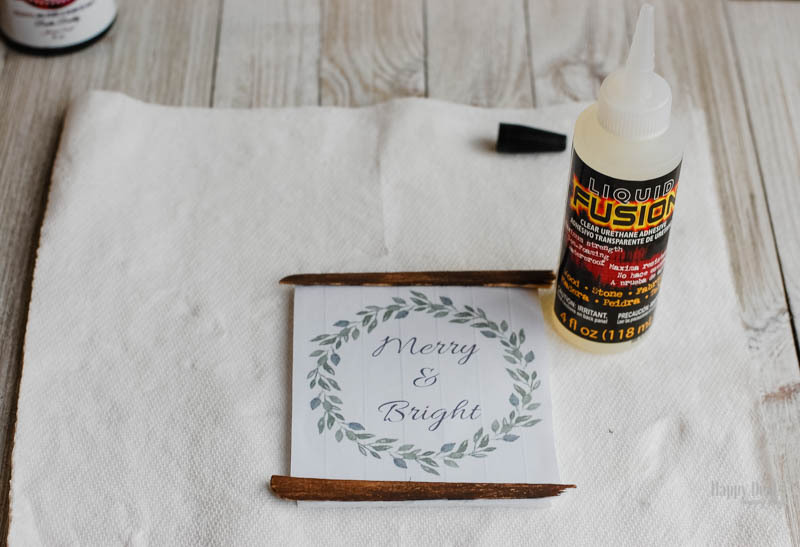 I love this stain because it is non-toxic, easily washes off if you make a mistake and is very versatile for many projects. You should check out the Unicorn Spit Facebook Page to see just how amazing this stuff can be (it comes in a bunch of colors and there are shimmery versions of it too!) I just used a paper towel to rub on the unicorn spit – somewhat unevenly on purpose – again for a rustic look. After it dries, you can get out some sandpaper and rough it up a bit more if you’d like. Let the sticks dry for 24 hours after staining and then you can use them as your border of your rustic Christmas ornaments. I like using the popsicle sticks as opposed to sticks I can get in my woods because they are flat and make it easier to glue on as a frame. 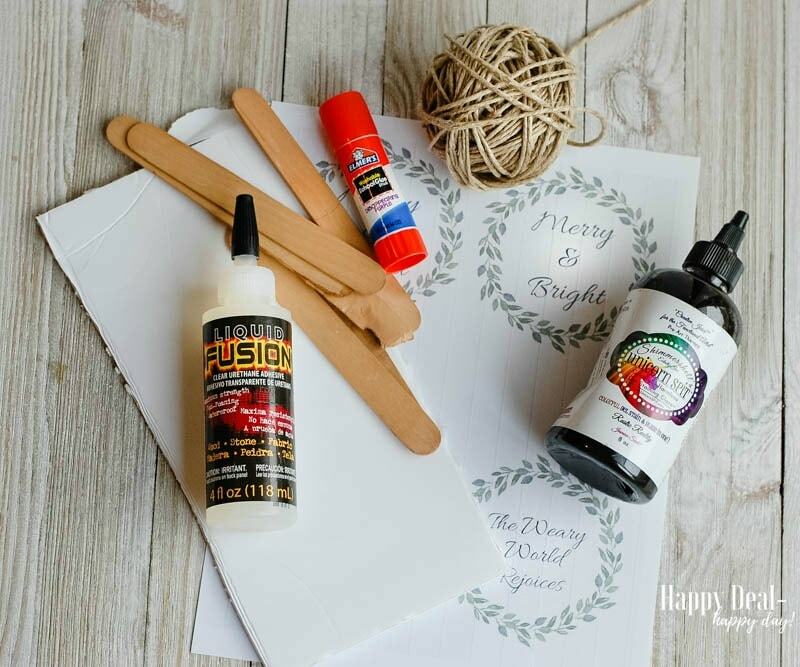 You could probably get away with using just Elmer’s glue, but I have Liquid Fusion that I use for many of my craft projects. It’s much stronger and I recommend using that to attach the popsicle stick frame to the ornament. Then you need to glue on some twine on the back that will be used to hang your ornament. You can also at this point grab some festive scrapbook paper and cover the back so that the glued twine is not showing – but that detail is up to you. 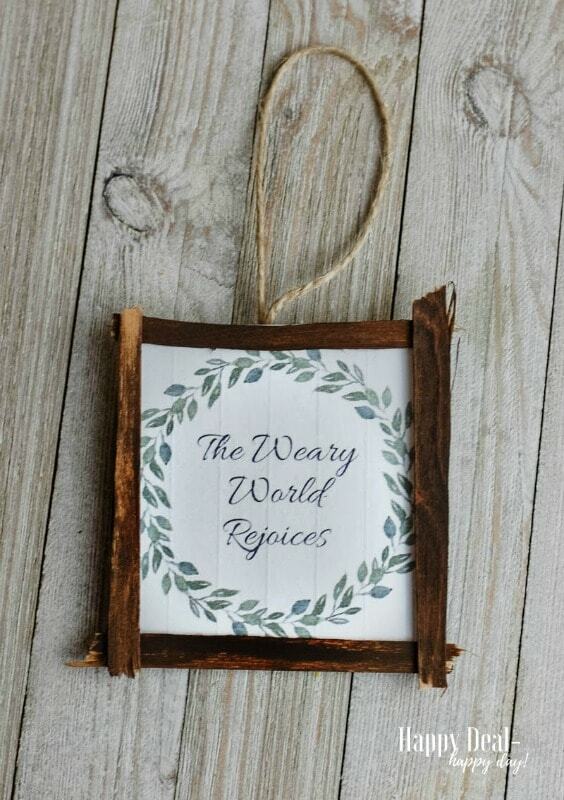 Here is one of the completed rustic “The Weary World Rejoices” DIY Christmas ornament. I like how it’s rustic – and represents the weariness we all may be feeling. But again, rejoice! This is the time to celebrate the miraculous birth of our Savior! You can make a set of two for your own tree and give the other two away as a gift topper, or as a teacher gift or to a neighbor along with some Christmas cookies! Make some homemade Frankincense Soap, wrap it in an upcycled tin, and top it with one of these ornaments for another DIY gift idea! 20+ DIY Christmas Ornament Ideas! 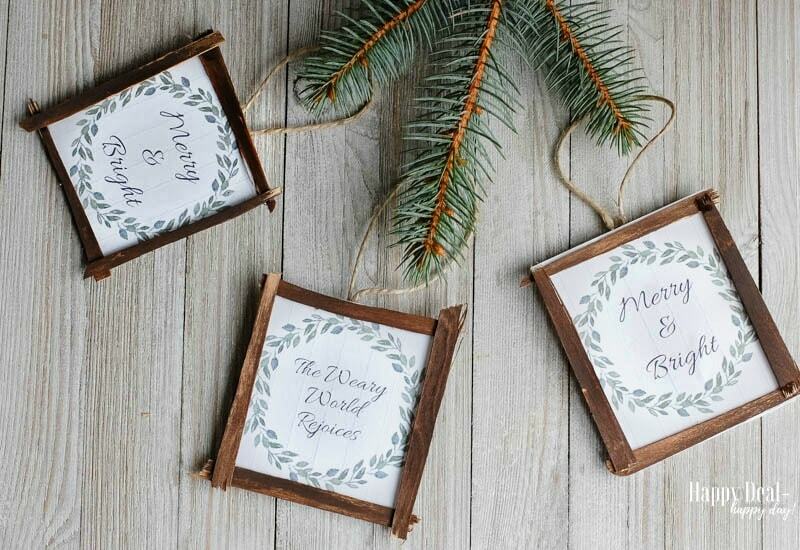 3 Responses to Free Printable DIY Rustic Christmas Ornaments! Such cute ornaments! I really love the rustic look to them. Thanks for sharing! My crafty daughter will love this. The link to get the printable ornaments doesn’t seem to be working. I have confirmed my subscription…now what do I do?